Have you ever heard the phrase, “You can take the boy out the country, but you can’t take the country out the boy?” You may have to change the setting or the gender, but I’m sure in one way or another, you’ve heard this saying or something similar to it. It Is what immediately came to mind as I read Welcome to Lagos by Chibundu Onuzo. Chike, one of the novel’s main characters, goes from leading one army to another; being a leader is in his blood. I chose “rebel” as this month’s theme because the characters in this novel are rebelling in one way or another whether it’s choosing not to do something your job asks of your or running away from a relationship that no longer serves you. I wanted the items included in this month’s box to serve as a reminder of the power we have to do good, the vibrancy of the setting of this novel, and of the personal characteristics that matter most. When your back is against the wall, it’s easy to compromise on your ideas of right and wrong especially when your survival is on the line, but the characters in this novel looked out for one another although they barely knew one another. They also showed an unwavering commitment to doing good when a different choice could’ve changed the trajectory of their lives. That is why I thought this card from Footnotes Studio defining “integrity,” and this Quotable Cards pin bearing the quote “Be the change you wish to see in the world” would be great additions to your box to serve as gentle reminders, if like most of us, your moral compasses need to be recalibrated on occasion. Lastly, Chibundu Onuzo does an amazing job of painting a portrait of Lagos from its bustling streets and traffic to the personalities of the people who live there. The beautiful cover art only enhances the imagery she creates with her words, and I wanted to pay homage to the vibrancy of the setting with these colorful notebooks from Kikkerland. So there you have it, another box in the books! Onuzo joins a long list of writers from the diaspora who are leaving their mark in contemporary literature. If you’re looking for more to read, check out this list of 12 Essential Books Celebrating Women Writers of the African Diaspora from Signature Reads. 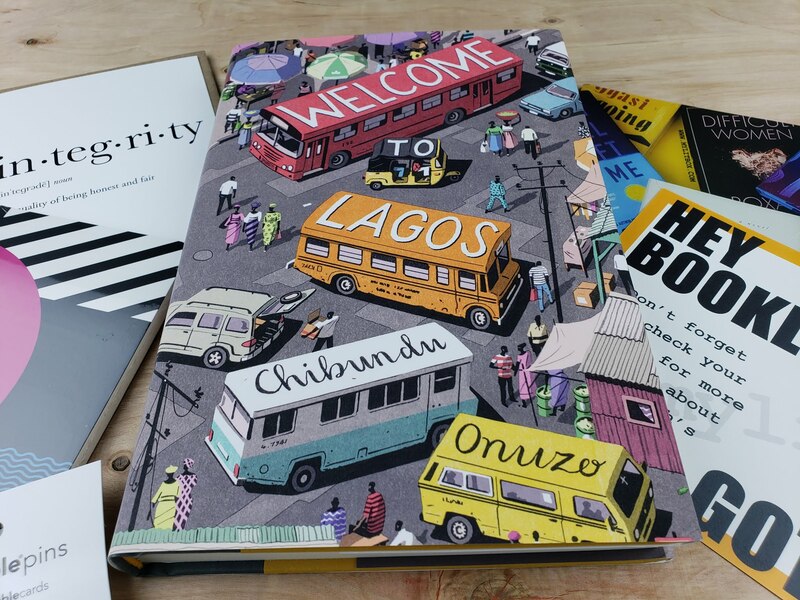 Once you have finished reading Welcome to Lagos, don’t forget to come back and share with us what you thought! Happy reading!